The Atacama Desert, primarily located in Chile, is a plateau in South America, covering a 1,000-kilometre (600 mi) strip of land on the Pacific coast, west of the Andes mountains. Both the Andes Mountains and the Chilean Coastal Range, which surround this desert, create a blockage of moisture, making the Atacama Desert the driest desert in the world, as well as the only true desert to receive less precipitation than the polar deserts. In fact, some areas have not have received rain in recorded history. The volcanoes, rocks, and plants found in the desert are shaped by these extreme conditions. The Altiplano, mainly located in Bolivia, is the most extensive area of high plateau on Earth outside of Tibet. 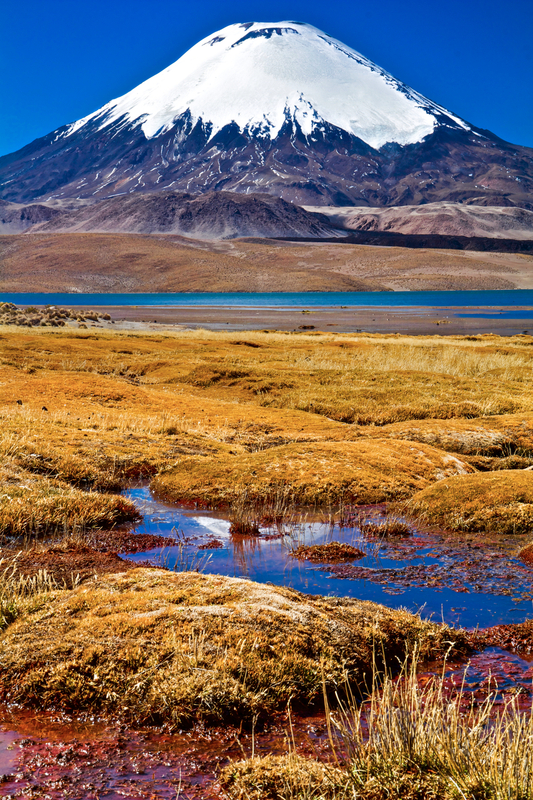 However, unlike Tibet, the Altiplano is dominated by massive active volcanoes. It is the widest part of the Andes mountain range and consists of several mountain basins that are connected together. The Altiplano has an average elevation of 12,000 feet above sea level, although it can reach well over 13,000 feet in some places. Both regions are extremely colorful and photogenic. In fact, outside of the Colorado Plateau in the U.S., I have never seen a land so rich in color and contrasts. Los Flamencos is a large protected area that houses a rich diversity of plants and animals in the middle of the Atacama Desert. Consisting of seven separate regions, each with different flora and fauna, it is perhaps the centerpiece of this arid desert and my favorite section of northern Chile. Ancient and extinct volcanoes dominate the landscape, particularly Miscanti (picture one) and Miñiques (picture two), both of which rise over colorful altiplanic lagoons. However, what sets this place apart is the surreal colors of the land. At Salar Aguas Calientes (picture three), I encountered turquoise water and “piedras rojas” (or red rocks) at the base of large mountains; and at Bofedal de Quepiaco (picture four), I photographed yellow-colored vegetation and algae mixed with deep red soil. The reserve is also home to Chile’s Valle de la Luna (Valley of the Moon), a beautiful area of eroded badlands shaped by wind and (occasionally) water. The rocks feature an impressive range of color and texture but the most amazing part is the abundance of salt on the ground. Wide areas of white salt cover the red rock (picture five) providing a nice contrast to the dirt. As the sun set, the soft light brightened the reds, browns, and salt whites of this surreal landscape. You can see the last of light hit the background peaks, including a volcano in the upper-right hand corner. The Salar is the largest in Chile and the third largest in the world, meaning there is plenty of room for scouting foreground elements to place in front of the many distant volcanoes. My favorite section, Laguna Cejar (pictures one and two), is a sinkhole that has collected water over time despite the aridity of the Atacama Desert. The salt concentration ranges from 5 to 28% (50 to 280 parts per thousand), producing (at the higher end of the range) a buoyancy like that of the Dead Sea. Tourists come here to float in the water but I was too enthralled photographing the place to get in and join them. There are so many volcanoes to be found around the nebulous area where the Atacama Desert of Chile meets the Altiplano of Bolivia. Giants like Parinacota (picture one) remain snow-capped year-round due to the extreme elevation and stable, cold temperatures. The beautiful mountain overlooks the muddy wetlands of Lago Chungará. Parinacota’s twin, Pomerape, are referred to together as the “Nevados de Payachatas” and are the centerpieces of Lauca National Park in Chile and Sajama National Park in Bolivia. Both can be seen behind the llama in the second photograph. The famous El Tatio Geyser Field is also located near the border on the Chilean side and is the third largest geyser field in the world. Located 4,320 metes above sea level, it is a cold and surreal eerie place in the winter. Myself and a group of other tourists left our hotels in the middle of the night to arrive here by sunrise, when the steam condenses in the frigid air. I found it hard to find an angle that was both loaded with plumes and not tourists. Fortunately, I stumbled upon this view just as the sun started to come up and fired away. The Altiplano in Bolivia is a dreamlike place of rolling mountains, colorful lakes and ponds, bizarre flora, and serene isolation. 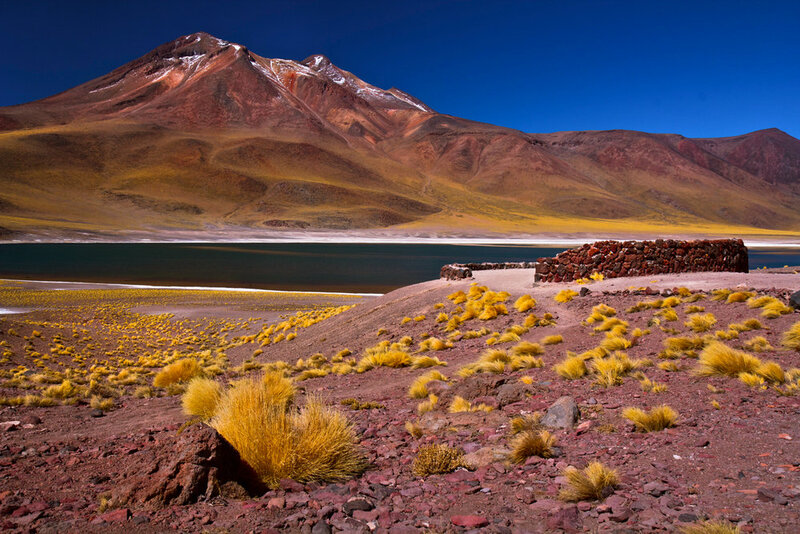 For example, Laguna Hedionda (picture one) and Laguna Colorado (picture two) are both high altitude lakes where bright yellow shrubs and ferns grow on the banks and flamingos feed in the multicolored waters. Beyond each are mountains and volcanoes of various sizes and elevations. Bolivia’s most famous natural landmark, the Salar de Uyuni (picture four), is the largest salt flat on Earth and driving through the perfectly flat surface without any background visual reference points disorients and obscures one’s sense of distance. Like Chile’s Atacama Desert, Bolivia has its own geothermal region, the Sol de Mañana geysers (picture six) and like El Tatio, the light was best right at sunrise.